Each year, the World Water Forum brings together a variety of experts, water managers, and organizations to discuss the world’s water challenges and potential solutions. This year, the Pacific Institute joined the discussion in its role as co-secretariat of the United Nations Global Compact’s CEO Water Mandate, an initiative focused on mobilizing business leaders to advance water stewardship, sanitation, and the Sustainable Development Goals (SDGs). 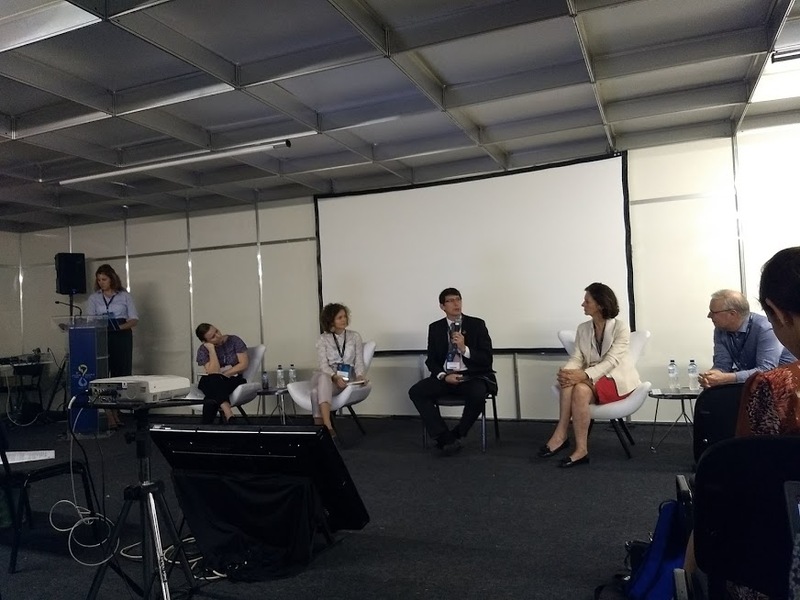 Following is a summary of our activities at the 8th World Water Forum in Brasília, Brazil from March 18th to March 23rd, 2018. The first ever Water Business Day (WBD) explored innovative approaches and solutions to securing and sharing water in the industrial sector. The event brought together high-level political and business leaders to explore innovative approaches and solutions to securing and sharing water in the industrial sector. Jason Morrison, President of the Pacific Institute and Head of the United Nations Global Compact’s CEO Water Mandate, presented the CEO Water Mandate and Water Stewardship Engagement Opportunities in the morning panel on engagement opportunities. This session explored the value driver for business action on the SDGs and featured innovative practices involving companies working in partnership to address local water challenges. What is the value driver for companies to take action on SDG 6, which calls for access to clean water and sanitation for all people, and other water-related SDGs? What are key innovations (collaborations or otherwise) to support the achievement of the SDGs, and how can these be brought to scale? How can private operators help overcome sanitation deficits in developing countries? 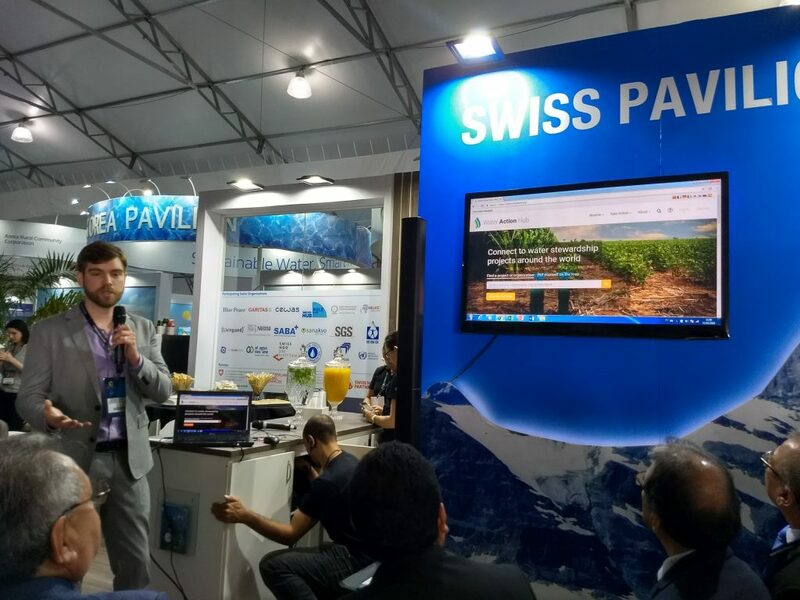 Pacific Institute Senior Digital Engagement Associate Peter Schulte, right, summarizes the main messages of the “Water Stewardship to Advance the Sustainable Development Goals (SDGs) and Create Shared Value” workshop during the 8th World Water Forum in Brasilia, Brazil. Companies implementing water stewardship are already inherently contributing to SDG 6 and other water-related SDGs. Multistakeholder collaboration, especially involving government, contributes to both the success and scope of water stewardship projects and must continue as new projects emerge and develop. Companies identified the need to create trust within the private sector in order to motivate more knowledge sharing and collaboration. While some valuable progress has been made, there is a continued need for businesses to engage in collective action projects at the river basin and national levels. SDG 6 provides a common language and shared goal that can be used to drive collective action among business, governments, NGOs, and other stakeholders. Companies can be a powerful force in building the enabling environment by sharing their internal tools, good practices, and knowledge with suppliers, small- and medium-sized enterprises (SMEs), and other companies. In doing so, they help build capacity and facilitate action on SDG 6. The results of Water Business Day were reported at a special session on March 22nd which included government representatives, academia, multilateral organizations, and civil society.The final Water Business Day report can be accessed here. From right to left: Pacific Institute Research Associate Abbey Warner; Pacific Institute Senior Digital Engagement Associate Peter Schulte; Pacific Institute President and Head of the United Nations Global Compact’s CEO Water Mandate Jason Morrison; Pacific Institute Research Associate Giuliana Chaves Moreira; and Pacific Institute Senior Research Associate Tien Shiao. Identify areas of mutual interest and opportunities for collaborative work in regions or issues of common interest, through 2018 and beyond. 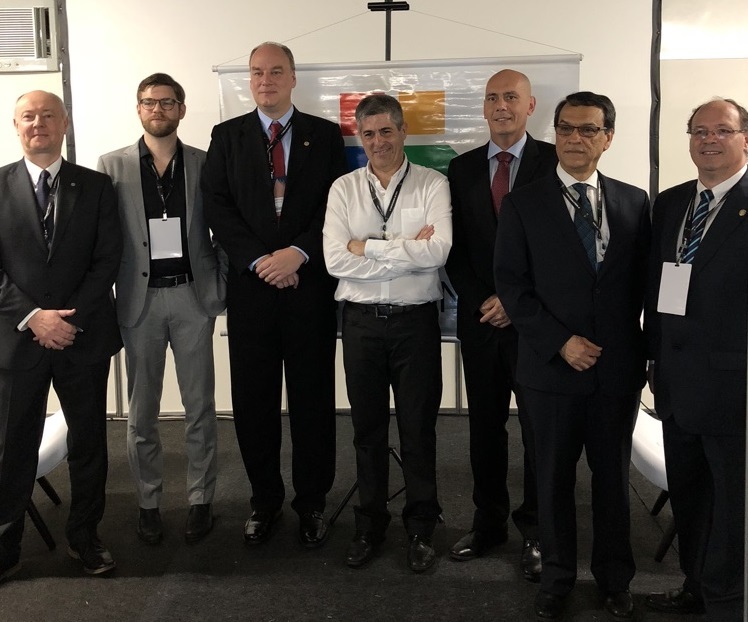 One significant outcome of the event was the partnership announced between the Global Compact Brazil Network, the CEO Water Mandate, and the 2030 Water Resources Group in São Paulo. 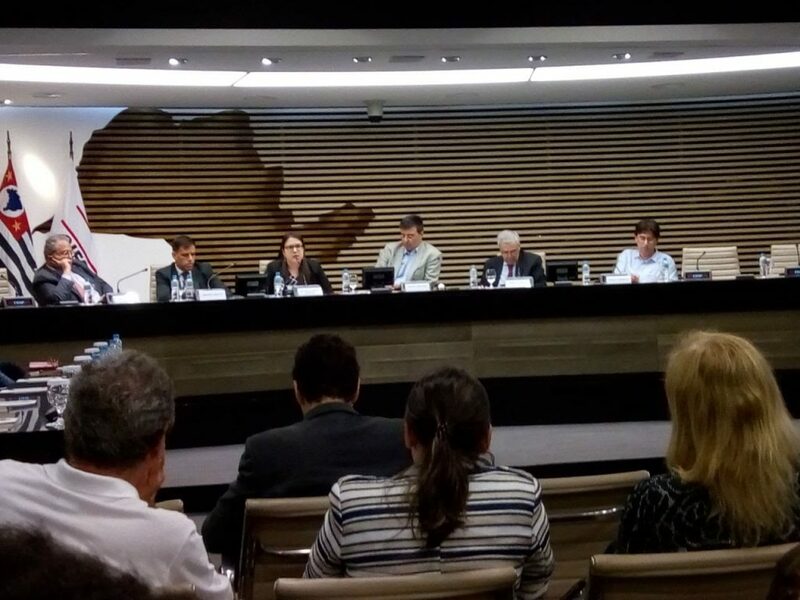 Since mid-2017, the 2030 Water Resources Group has been working to advance water security in São Paulo through projects to reuse effluents from domestic sewage treatment stations and projects to improve the performance of sanitation services in small and medium-sized municipalities. 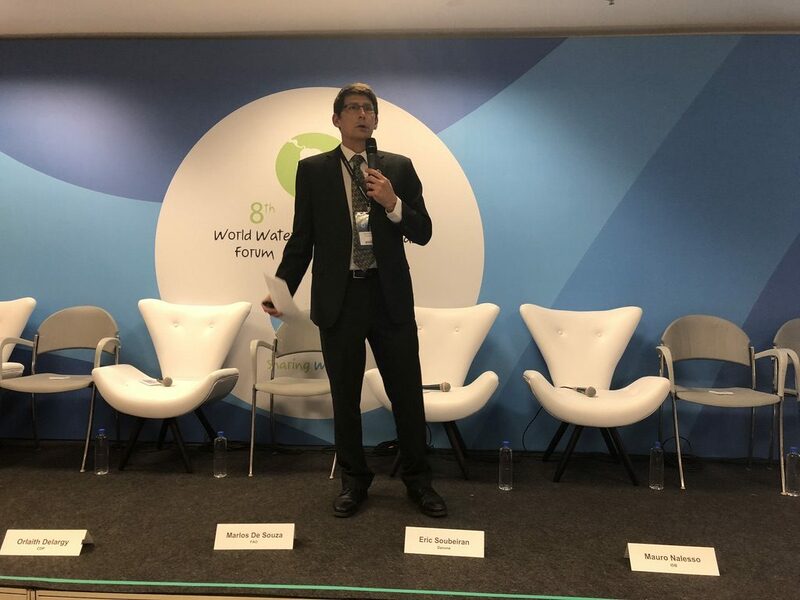 The partnership formed during the 8th World Water Forum event will focus on advancing water security in Brazil through water reuse and the circular economy. Read the blog post on this event by Pacific Institute Research Associates Abbey Warner and Giuliana Chaves Moreira. Pacific Institute President and Head of the CEO Water Mandate Jason Morrison, center, gives an overview of the WASH4Work initiative at the Toilet Board Coalition session. 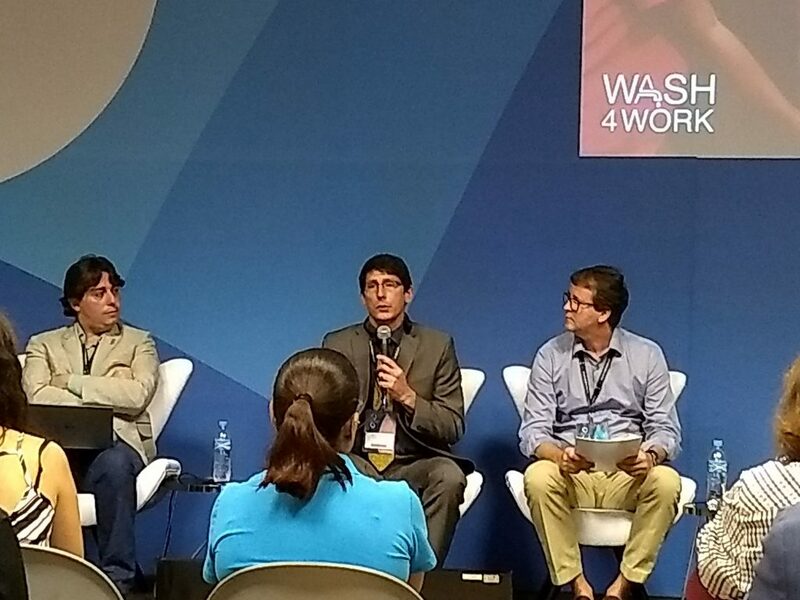 Pacific Institute President and Head of the CEO Water Mandate Jason Morrison gave an overview of the WASH4Work initiative at the “An Action Agenda for the Sanitation Economy — Toilet Board Coalition” session. How are business in your organizations approaching sanitation (risk mitigation/new business opportunities)? What are the main challenges faced by business in the area of sanitation? What are the key opportunity spaces to speak with one business voice? Pacific Institute Senior Digital Engagement Associate Peter Schulte led a discussion on solutions within the water-energy nexus that touched on hydropower, SDG 6 and SDG 7, and the water-energy-food nexus as it relates to desalination. Pacific Institute Senior Digital Engagement Associate Peter Schulte, second from left, moderated the session “Water Security and the 2030 Agenda for Sustainable Development,” which highlighted solutions within the water-energy nexus. Can the Private Sector Unlock Nature’s Solutions? Pacific Institute Senior Research Associate Tien Shiao participated in a panel discussion at this event focused on utilizing the private sector to explore and implement natural solutions to global water challenges. Pacific Institute Senior Research Associate Tien Shiao, second from left, participates in a discussion focused on utilizing the private sector to explore and implement natural solutions to global water challenges. Pacific Institute President and Head of the CEO Water Mandate Jason Morrison presents on the need for cross-sectoral approaches for climate change adaptation. Water users and managers are already feeling the water-related effects of climate change, including changes in water availability, degradation of water quality, and increased frequency of extreme weather events. Globally, there are hotspots for exposure to water, land, and energy impacts; water risks also disproportionately affect the poor and vulnerable countries. Ultimately, water is a risk multiplier, but also a precondition for sustainable development and a solution enabler. This panel discussion highlighted current climate change adaptation strategies employed by water users and managers, and included representatives from agriculture, industry, development banks, research institutes, international associations, public utilities, and NGOs. Collaborative, cross-sectoral adaptation is the most effective response to climate change; water challenges cross borders and sectors, so the most successful responses occur when stakeholders act collectively. A proactive systems approach to the water-food-energy-climate nexus will provide resilience to climate impacts with greater efficacy than reacting solely to direct threats. This event featured the Business Alliance for Water and Climate Change (BAFWAC), of which the CEO Water Mandate is a founding partner. From Water Use Efficiency to Stewardship: Is Industry Aware of Its Water-Related Risks and Opportunities? At this event focusing on business water risks and opportunities, water, sanitation, and hygiene (WASH); water stewardship; and WASH4Work were explored. Pacific Institute President and Head of the CEO Water Mandate Jason Morrison, center, discusses business water risks and opportunities. 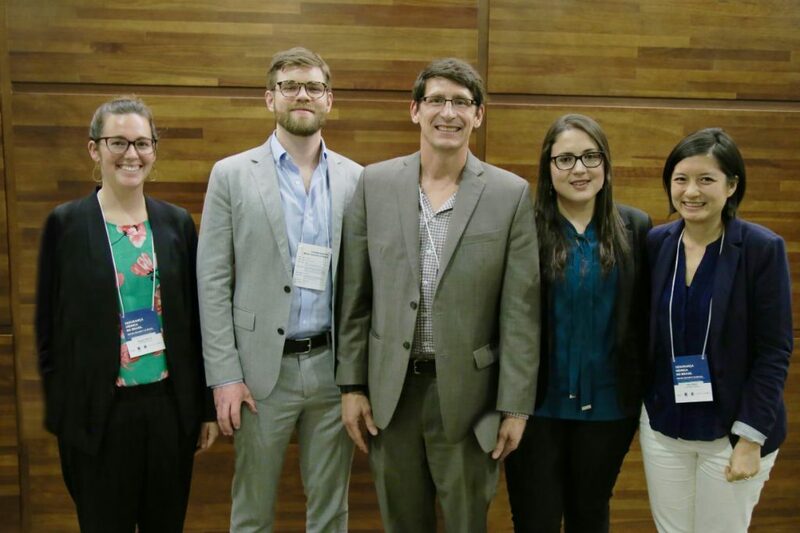 This event featured examples of water stewardship in Latin America, as well as profiles of online tools and resources to help companies and other interested parties achieve greater long-term sustainable water management. Among other resources, the localization feature of the Water Action Hub for Colombia was featured. Pacific Institute Senior Digital Engagement Associate Peter Schulte presents on the localization feature of the Water Action Hub for Colombia. Pacific Institute Senior Research Associate Tien Shiao discussed business water risks and corporate water stewardship responses during this side panel held in the International Union for Conservation of Nature (IUCN) booth, highlighting the importance of considering water in the long term for continued business viability. Pacific Institute Senior Research Associate Tien Shiao, center, presents on water risks faced by businesses. 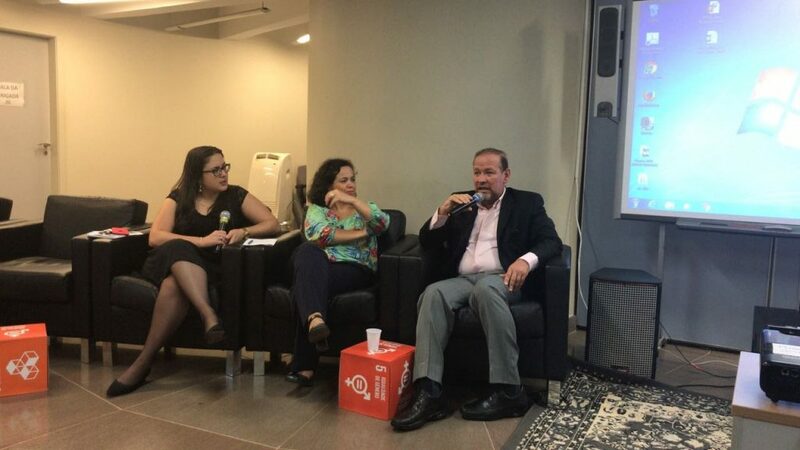 Pacific Institute Research Associate Giuliana Chaves Moreira, left, moderates a discussion in a workshop focused on private sector collaboration for the SDG 6 targets set forth in the Brazilian Plan of Action for the Sustainable Development Goals (SDGs). The Sustainable Development Goals Planet event took place in parallel with the 8th World Water Forum, promoted and organized by the government of the federal district (GDF) of Brasilia in partnership with the United Nations Development Programme. The event’s objective was to enable the promotion and implementation of actions promoting the achievement of the goals set by the Sustainable Development Goals (SDGs) with a focus on water and sanitation issues identified in SDG 6 that are intrinsically related to the theme of the 8th World Water Forum. The United Nations Global Compact Brazil Network coordinated the Workshop: “Private Sector Collaboration for the SDG 6 Targets Set Forth in the Brazilian Plan of Action for the Sustainable Development Goals (SDGs).” The purpose of this workshop was to discuss the means to build a scalable solution through cooperation between the private sector, civil society, and government by 2030, to achieve SDG 6. Pacific Institute Research Associate Abbey Warner discusses enhancing climate resilience of water, sanitation, and hygiene systems. 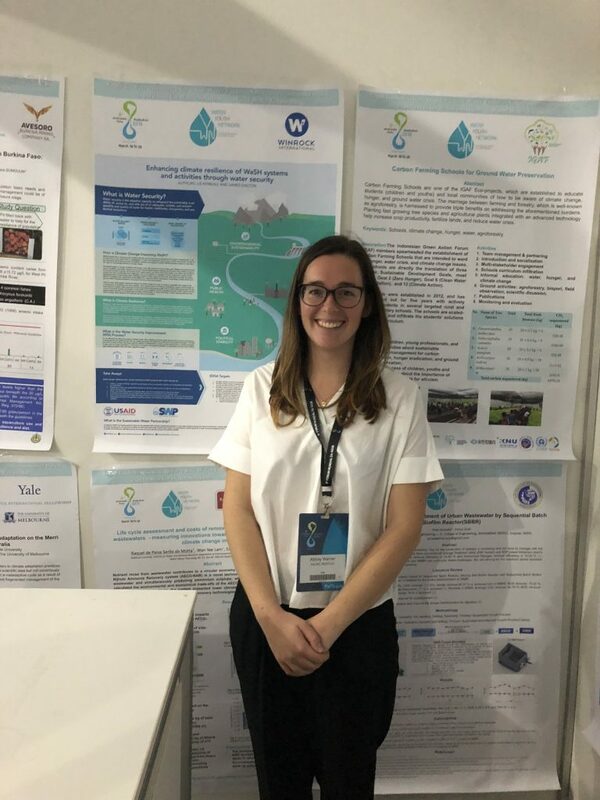 At this poster presentation, Pacific Institute Research Associate Abbey Warner presented the Sustainable Water Partnership, a USAID initiative that works to improve water security at the basin level through a multistakeholder process. Water security is the adaptive capacity to safeguard the sustainable availability of, access to, and safe use of an adequate, reliable, and resilient quantity and quality of water for health, livelihoods, ecosystems, and productive economies. The Water Security Improvement process is currently being piloted in Pakistan, Cambodia, Tanzania, and Kenya. 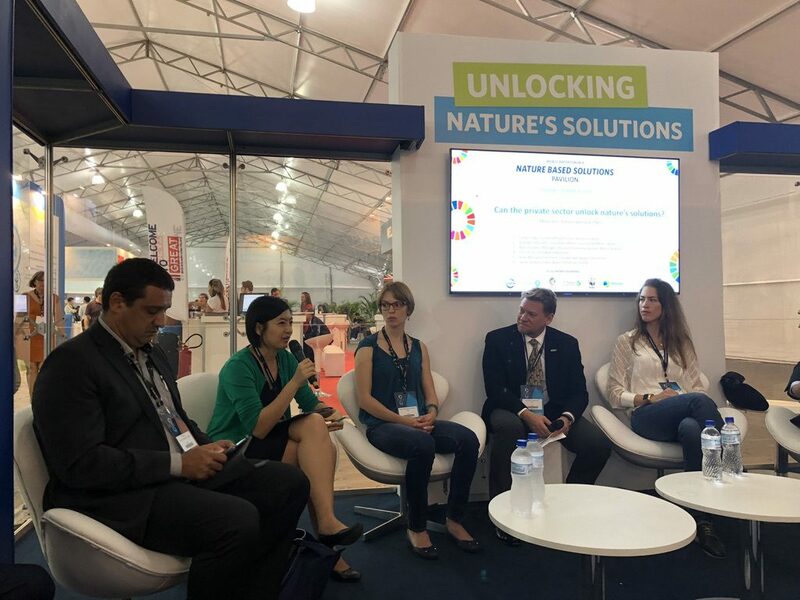 Pacific Institute Research Associate Giuliana Chaves Moreira, third from left, discusses the events promoted by the CEO Water Mandate and the Global Compact Brazil Network during a World Water Day workshop following the 8th World Water Forum in Brasilia, Brazil. 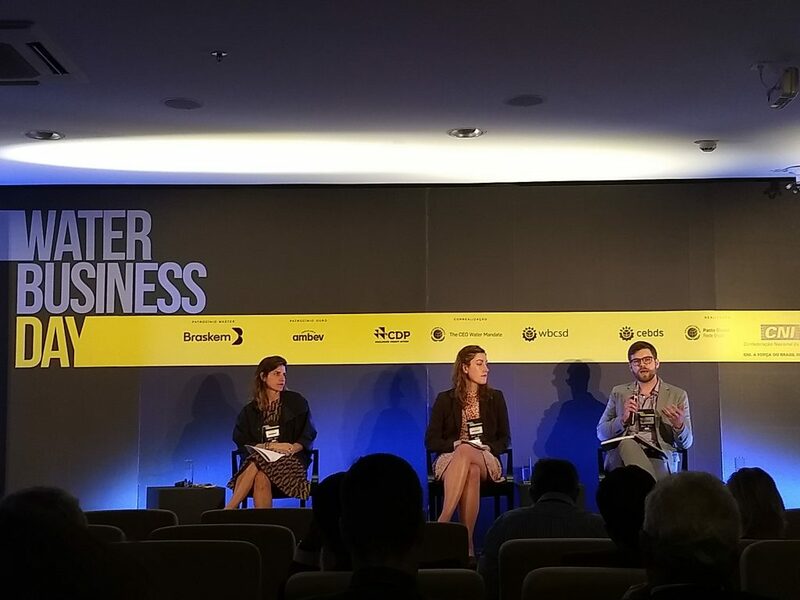 At this event, Pacific Institute Research Associate Giuliana Chaves Moreira discussed events jointly promoted by the CEO Water Mandate and the United Nations Global Compact Brazil Network, highlighting the Water Business Day held on March 18th during the 8th World Water Forum. The objective of this event was to assess the impact of the discussions held at the 8th World Water Forum and the actions that the industry sector needs to implement in relation to private and public policies in order to ensure the availability and sustainable management of water in accordance with the Sustainable Development Goals (SDGs). During the event, the Manual for the Rational Use of Water in the Industrial Sector was also launched. The event was attended by the President of the World Water Council, Benedito Braga. 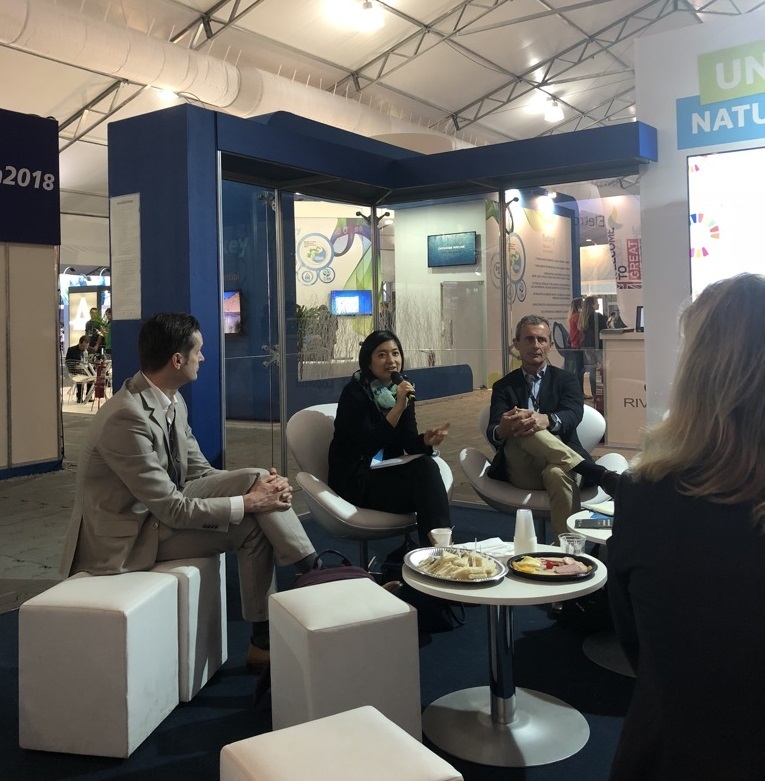 Pacific Institute Research Associate Giuliana Chaves Moreira discusses the events promoted by the CEO Water Mandate and the Global Compact Brazil Network during a World Water Day workshop following the 8th World Water Forum in Brasilia, Brazil. 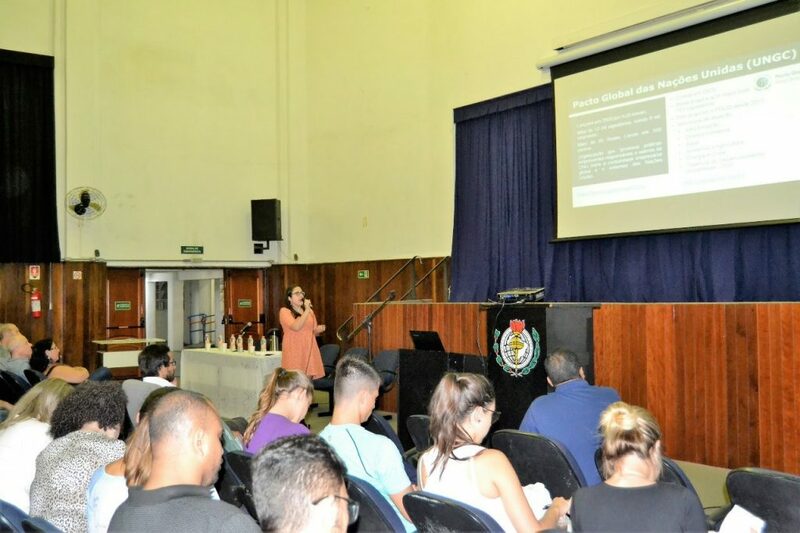 At this event, Pacific Institute Research Associate Giuliana Chaves Moreira discussed joint events promoted by the CEO Water Mandate and the United National Global Compact Brazil Network, highlighting the role of companies in achieving the Sustainable Development Goals (SDGs), with an emphasis on SDG 6. She also highlighted the fact that the first Water Business Day in the history of the World Water Forum was held on March 18th, promoting greater business engagement in the water agenda. This initiative inaugurated a process of systematization of business actions in the quest for water security in the context of the discussions of the World Water Forum.